Dandelion seeds are supposed to bring good luck – except if you happen to be a lawn, in which case dandelion seeds are the plague! Sometimes careful pre-visualisation works; the finished picture and the setup becoming crystal clear in the mind before you have even reached for the camera. Other times, the finished photo is more the result of trial and error. This was one of those other times. 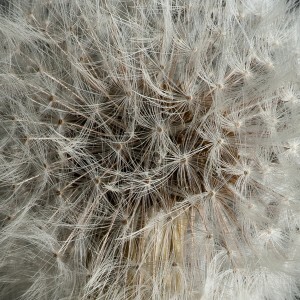 Having watched the dandelions bloom and the seeds blowing in the air, I had decided I wanted a dandelion picture. It was as vague as that, so I started by carefully picking a dandelion and carrying it into the living room. We’ve got less wind in here, and by getting it up on a table, I didn’t have to crawl around on the ground in the garden. Too many other things crawl around in that garden, if you know what I mean…. Anyway, having put the dandelion in a small planter with some soil to hold it, I put the keylight (flash in softbox) on the camera right and a piece of foam board as reflector on the left. Put a macro lens on the camera and got up nice and close so you could see all the tiny little hairs on the seeds on the photo. It was a nice enough picture, plenty of detail, and after a few trial shots I also had the light dialled in so everything looked crisped and fresh. But it was… how shall I put this… boring. It could probably have been the catalogue pic for the gardener’s seed catalogue, in case they sell dandelions. So I grabbed a pair of nice salt and pepper shakers we’ve gotten for Christmas from a friend. 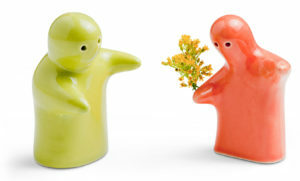 They are cute figures, and they could add a splash of colour to the picture. After a couple of shots, I decided this was probably as good as it was going to get. The images were fine – nice crisp light, nice macro view of the seeds, nice all in all. So I began to pack everything up again, all the while thinking that whilst “fine”, the pictures weren’t that interesting. Nice, but not “hang it on the wall”-nice. When I had gotten everything packed away and reached for Ms Red, my hand brushed against the dandelion and I thought “oh no, don’t knock the seeds off so we’ve got them all over the house”. The next thought was “aha!”. 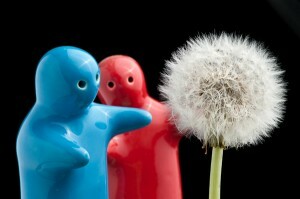 Wouldn’t it make the image so much more interesting, if the figures were seen to blow dandelion seeds at each other? So I set the kit up again and got back to work. Hey, see that funny flower! While it’s easy to blow the seeds off a dandelion, doing the same thing when you can’t get your face close (because you’re trying to avoid having it in the picture) is not particularly easy. I tried blowing at it from under the softbox. I tried to use a rocket blower. I tried to use a blower for the fireplace. 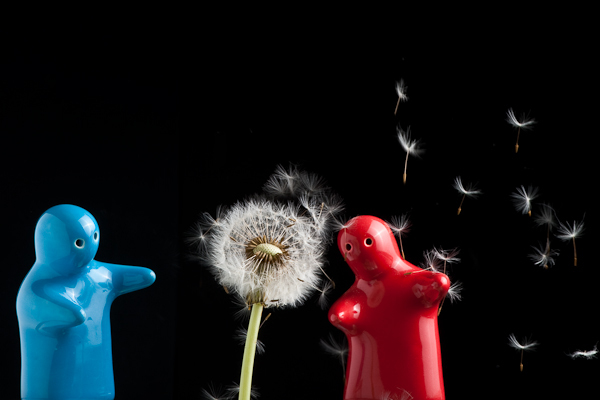 In the end, I had to just take a handful of seeds from another dandelion, let them fall over the figures, and try to trip the shutter at the right time. The seeds tend to clump together when handled, so in the end I picked the handful of shots where there were individual seeds in the air and merged them in Photoshop. It would have been nice if I had started with the final idea, so I didn’t have to first spend half an hour on trial and error. But sometimes that’s the way it goes. The idea might be there, or maybe it’s not at all, but if it is, it’s so far in the back of your head that it won’t come out unless you start to play around with other ideas. Sometimes it’s better to just play around with the subject, than it is to completely discard the shoot because you haven’t got everything worked out. The seeds I was afraid of knocking off the dandelion? After packing everything up for the second time, I carefully gathered as many as I could. The rest are probably inside my computer by now, and I’m sure there’s one, patiently sitting in a corner of the room, waiting until I need to swap lenses. It will then rush over to me, fly into the camera and stick itself to the mirror or to the sensor in a split second. So much for dandelion seeds bringing good luck!